Keloid Treatment In Delhi with expert Dermatologist. What is Keloids and hypertrophic scar? Keloid And Hypertrophic Scar is a kind of skin growth that appears usually at the site of skin damage. After this trauma the skin heals by the growth of a fibrous tissue resulting in a skin growth or scar. 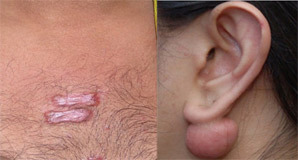 Keloid mostly occurs on the exposed site like earlobe, chest or face. Hyperthrophic scars usually formed after the trauma or injury. They can increase in size and number and may interfere with routine activities of the patient. As disfiguring marks left on the skin by healing of injured tissues, keloids can be seen as firm, raised, soft and at times shiny growth on the skin - they are not painful but there can be itching, burning sensation or inflammation at times. Pink or red colourscars and usually darker or lighter than the colour of surrounding skin. At times they can extend beyond the limits of original woundwhich can be disfiguring. Changes in colour, shape and size of scars with time. Keloid scars typically develop on the arms, ears, back, lower legs, chest and neck. They can appear with healing of wounds or may develop over months and years. They are a pattern of skin healing after its damage by acne, burns, cuts, chicken pox, insect bites, piercing or tattoo. It surfaces like a hypertrophic scar, but expands outside the wound margins and generally builds over time as the skin growth. At skin n laser centre, this condition is treated by the experts by medications (topical,oral or injectable) which makes it soft and helps to flatten it easily. Surgical removal - this is done for huge keloids or scars by the team of plastic surgeon and dermatologist. Fractional carbon dioxide (CO2) lasers are one of the latest advances in non-surgical skin resurfacing treatments. How does fractional Co2 laser works?